JJ IN DA HOUSE: Richard Rivalee @ M Mall, Penang. Richard Rivalee @ M Mall, Penang. How often do you get to taste cooking by a famous fashion designer? But if you are in Penang, you must be very lucky to get to taste a traditional Nyonya cooking by a renown fashion designer Richard Rivalee. The former Richard Rivalee restaurant was located at his couture shop which was at Bangkok Lane Penang. Recently Richard Rivalee has moved into M Mall and became one of the most popular restaurants serving all sorts of Nyonya dishes to the diners. The restaurant also comes with a mini seminar place on the second floor that you can book for a private event. The place is beautifully decorated with many antiques, decorative items and also furnitures. Though the place is much bigger, but I still prefer the previous place that was packed but very nostalgic surrounded by all the Nyonya clothes and stuff. We were served with a plate of their pea flower rice. The pickles served along with the rice was refreshing and works perfectly as a palate cleaner to get you ready for your meal. Five Spiced Loh Bak is one of the Nyonya's signature dish. You can taste how well the Nyonya cuisine played with spices to make their dish great. The loh bak served was pretty thick and filled with layers of meat, even better when you eat with their homemade chili sauce. The famous Nyonya dish Babi Pongteh is also a must. The lean pork was slowly braised to perfection and it was soft and tender. The thick gravy absorbed into the meat and simply hearty, perfect to go with a plate of plain rice. Jicama Fried with Cuttlefish(Jiu Hu Char) is also one of the most popular dishes among Nyonya cuisine. It is expected to be fragrant, soft and it has to be wrapped with a leaf of lettuce and a little big of sambal to make it taste even better. We like the amount of cuttlefish that were added into this dish that made it more fragrant and tasted better than what we usually get outside. Acar Fish is one of the best dishes among our dinner. I'm not a fish person but I like the stuffed pickles that give a good refreshing chill in the mid of your meal. It was really appetizing and addictive as it was stuffed with crunchy sliced papaya hence making it slightly sour and refreshing. One of our 4 main soups in Nyonya cuisine would be none other than Asam Pedas. The asam pedas here is cooked with ikan kembung to give the soup a more fishy but greater taste. The soup was a little bit too spicy and sour to my liking, but nevertheless it is a great soup just that it has to be richer and thicker. Asam Prawn is my favourite dish among all. Prolly because this is also my favourite dish at home and mom don't always cook this dish. I like the taste of thick asam gravy coated around the prawn and shell. I wouldn't waste any drop of the sauce and will swallow it all even though it could be really salty and sweet. That's how you should enjoy your asam prawn, especially when the prawn is really fresh. As Richard is a Chinese-Thai mixed, there's also quite a big Thai influence in his family's Nyonya cuisine hence we can also find Green Curry Chicken on his menu. If you were to ask me how different is his Green Curry Chicken compare to Thai restaurant, I would say that the gravy is thicker and more herbs were used to make it fragrant and delicious. Braised Pork Belly in Soy Sauce(Tau Yiu Bak) is also my favourite dish. These are all the home dishes that all moms will usually cook. The thick pork belly was sliced into cubes and slowly braised until they are soft and tender, together with fried tofu, mushrooms and hard boiled egg. This dish is simply hearty and perfect to go with a plate of rice! Pig Stomach Soup(Tu Tor Thng) is a very addictive soup that you can't stop once you have started. The more pepper the better is what we would expect from this boiled soup. The spiciness from the soup is what made it so addictive and not forget the chewy pig stomach too! How could a meal be completed without some nicely crafted dessert? We had the Bubur Cha Cha that was cooked with very thick and creamy coconut milk, though it was sweet but it was really classic and delicious. I like the bananas, potatoes, yam and all the other ingredients that was perfectly cooked and soft that made this dessert one of the best Bubur Cha Cha I've ever tasted before. 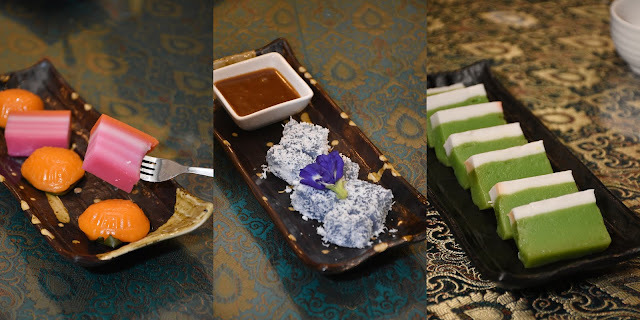 There are also some traditional Nyonya kuih available on the menu. There are Kuih Talam, Ang Ku Kuih, Thousand Layered Kuih and among them all I like the Sago & Gula Melaka the most. The sage was soft and sticky and best to dip it into the Gula Melaka that served together, also with the grated coconut made it more fragrant and tasty. A hearty meal full with surprise.